All Chocolate Fountains by Sarah’s Sweet Fountains » Blog Archive » SEPHRA ELITE CHOCOLATE FONDUE FOUNTAIN - BACK IN STOCK & READY TO SHIP! SEPHRA ELITE CHOCOLATE FONDUE FOUNTAIN - BACK IN STOCK & READY TO SHIP! FINALLY … THE WAIT IS OVER!!! Our most popular home chocolate fountain, the 19″ Sephra Elite, is back in stock and ready to ship! HURRY - GET YOURS BEFORE THEY ARE GONE!! Why is this model so popular? The Sephra Elite chocolate fountain is the HIGHEST quality home chocolate fountain on the market!! The Sephra Elite Chocolate Fondue Fountain is the ultimate accessory for every fondue lover and home entertainer. Elegant styling and dishwasher safe parts, including a removable basin and a WhisperQuiet motor, make the Sephra Elite Fondue Fountain the perfect addition to any special occasion. * Basin capacity: 6 lbs. 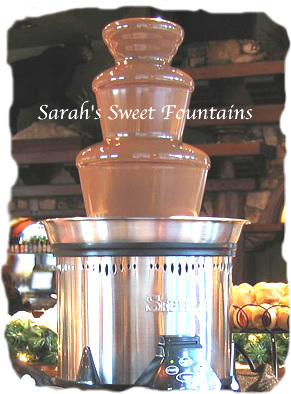 Sephra Chocolate Fountains is the leading chocolate fountain manufacturer in the world. Sephra chocolate fondue fountains are known by food service professionals around the world for superior quality, features, and unmatched customer support. Sephra’s determination to create the best chocolate fountains in the industry has made it the pioneer in the innovation of the chocolate fountain. Unlike other chocolate fountain manufacturers that make a variety of unrelated products, Sephra has the capacity and capability to create precision-engineered chocolate fountains that are superior to the competition in every way, setting the standard of quality and reliability for the rest to follow. This entry was posted on Wednesday, June 29th, 2011 at 1:05 pm	and is filed under Announcements, Chocolate Fountain, Home Chocolate Fountains, Sarah's Sweet Fountains, Sephra, Sephra Home Chocolate Fountains. You can follow any responses to this entry through the RSS 2.0 feed. Both comments and pings are currently closed.